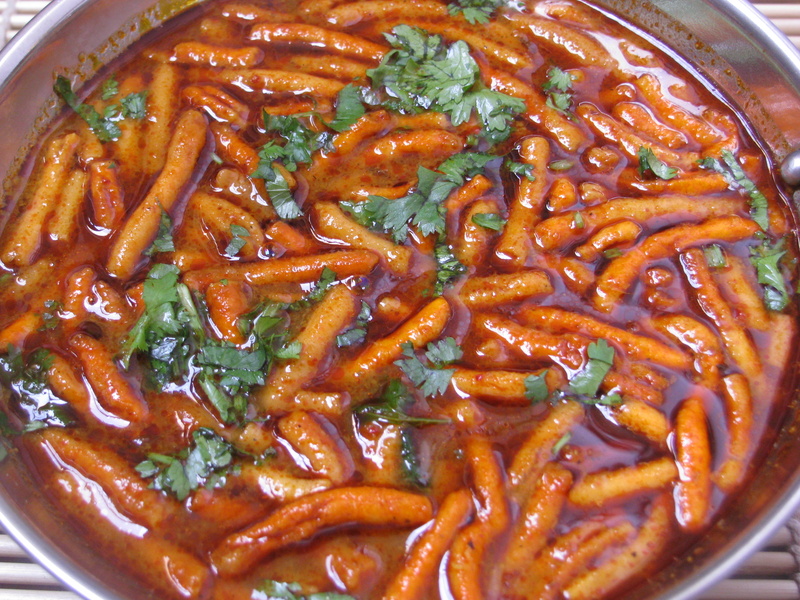 The recipe of spicy gravy with sev is called as Shev Bhaji in Marathi. When I make shev bhaji at my home I have to make extra chapattis or bhakri (ज्वारीची भाकरी / बाजरीची भाकरी jawar or bajra roti) . My mom use to make gravy masala of shevechi bhaji on pata- warwanta(पाटा वरवंटा ) & always made it in Iron Kadhai (लोखंडी कढई lokhandi kadhai) . My mom was very patient lady, sometimes we used to ask her randomly to make this recipe and if at that time there is no ready-made Shev is at home my mom made it with Sev maker . I still remember the taste of that tasty gravy. My mom was Gujarati but born and brought up in Maharashtra so both shev bhaji and sev tameta nu shaak was cooked at my home. Shev tameta nu shaak comparatively takes less time to cook as compare to shev bhaji, but for spicy food fans it’s a feast .Shev bhaji or shev rasa bhaji is made in different ways in each parts of Maharashtra. In Maharashtra if you travel by road you can get a nice spicy shev bhaji on roadside dhabas. If you want to make Dhaba style shev bhaji just increase the amount of oil , red chilly powder and garam masala . They add less dry coconut .Well I add little oil in my shev bhaji to make it little low in calories. To make shev bhaji healthy as well as tasty I have shared some of my tips at the end of this recipe. In Khandesh this spicy recipe is also called as Shevanchi Lal Bhaji .Shev bhaji curry masala is prepared with dry coconut, onion, garam masala, corriander powder etc. 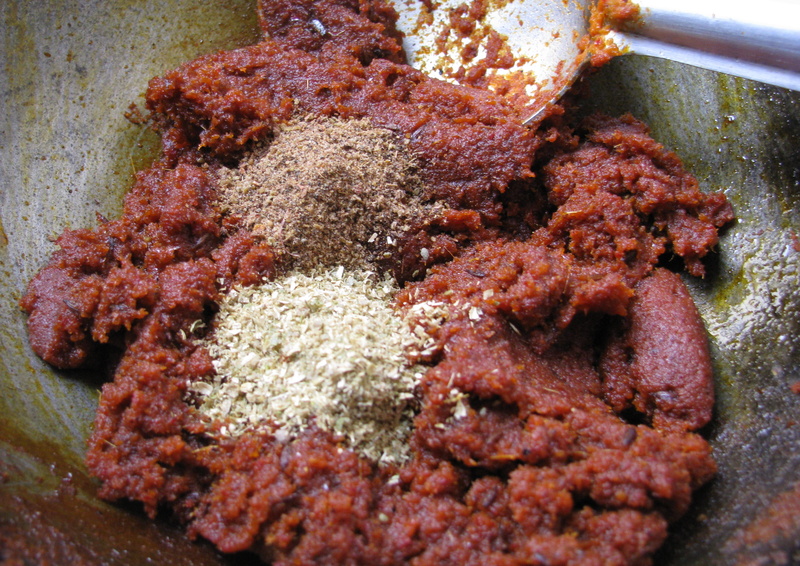 In authentic khandeshi style shev bhaji tomato is not added in the curry . 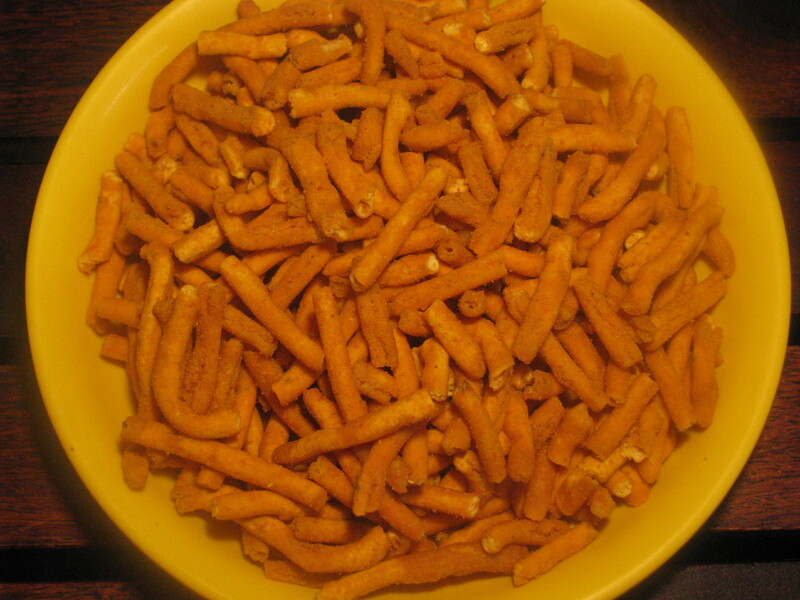 You can add Kala masala (खान्देशी काळा मसाला Khandeshi kala masala) or Kolhapuri garam masala or normal garam masala according to your taste in shev bhaji .. Kolhapuri garam masala is comparatively very hot as compare to kala masala or garam masala. 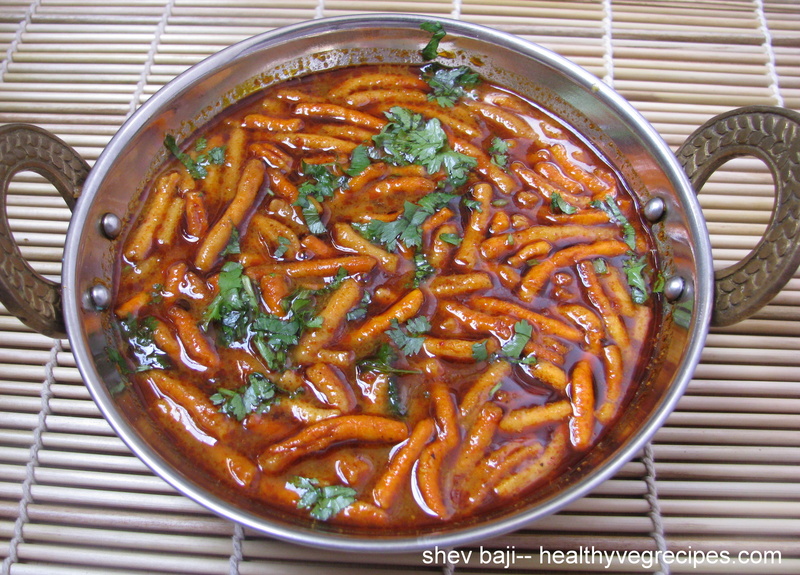 I have explained step by step recipe of shev bhaji , share your queries and suggestions for this recipe . 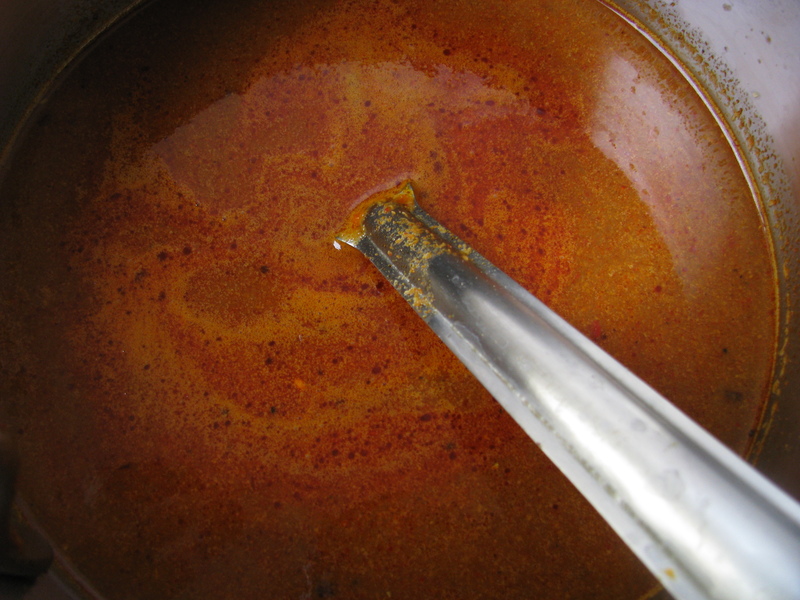 Note- Use Iron Kadhai ( lokhandi kadhai) to make Shev Bhaji or any rassa bhaji. It gives nice taste and color to the recipe. Roast onion with 1 teaspoon oil until it becomes light brown now add dry coconut (khopra) to it and roast it until it becomes brown . let it cool down. 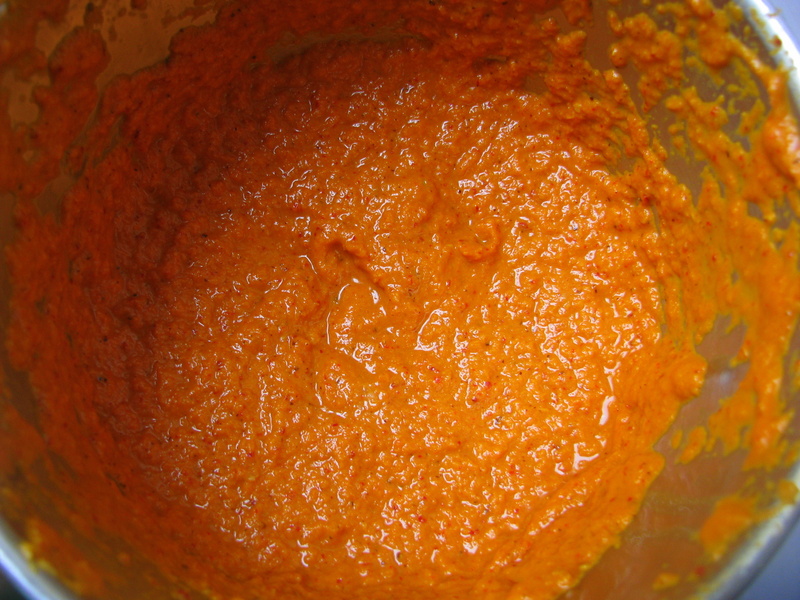 Take roasted onion coconut,red chilies, ginger ,garlic in a mixer jar and make a fine paste of it . 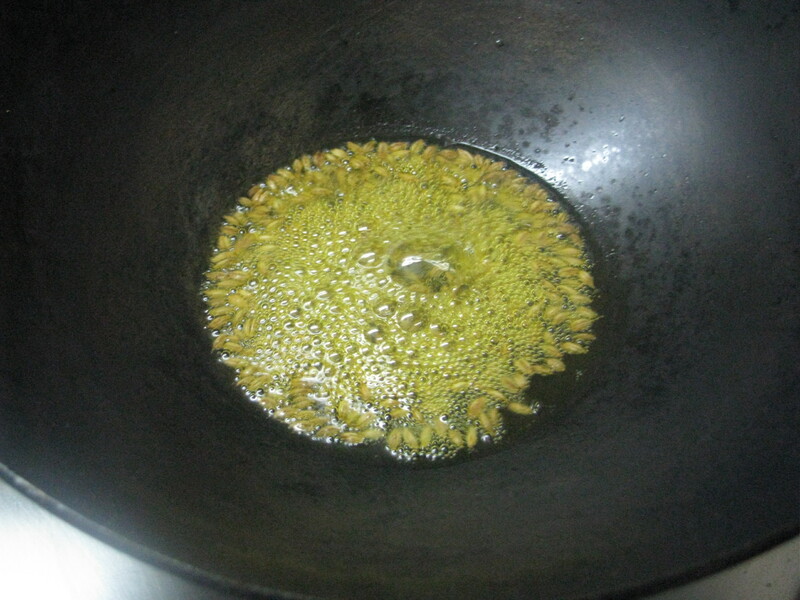 Heat oil in a pan and add cumin seeds (jeera) to it . 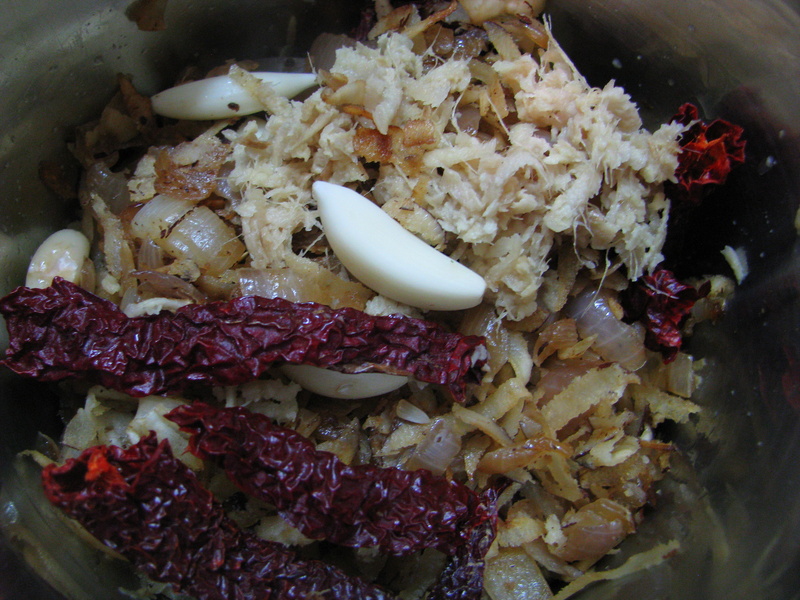 Then add fine paste of onion ,coconut ,red chillies, ginger& garlic to it. Add little salt and sauté it for a while . Sauté it until oil start separating from masala . 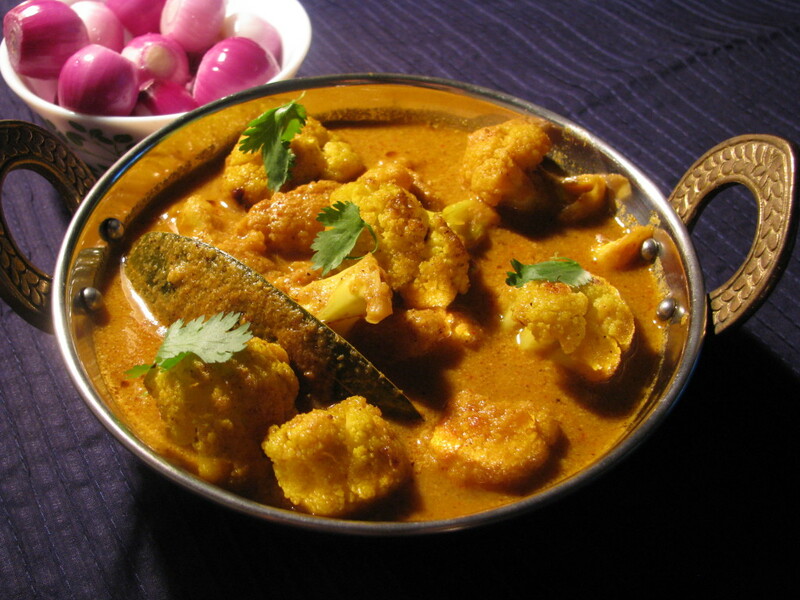 Add coriander leaves in this gravy masala (rasa masala) . I have transfered the dry masala from kadhai into big vessel as it was small. Now add 4 cups of water in masala to make rasa for shev bhaji, we r adding lot of water in gravy as when we add shev in rasa (gravy)it will soak lot of water . Let it boil on low flames for 4-5 minutes . Check the salt , add little more if required. Remove gravy (rasa) from the heat and add shev to it . Serve shev bhaji hot with chapattis or bhakris or phulkis or even with paratha or kulcha. Add less oil while making masala, as shev has already lots of oil in it. Add shev when you r serving it. 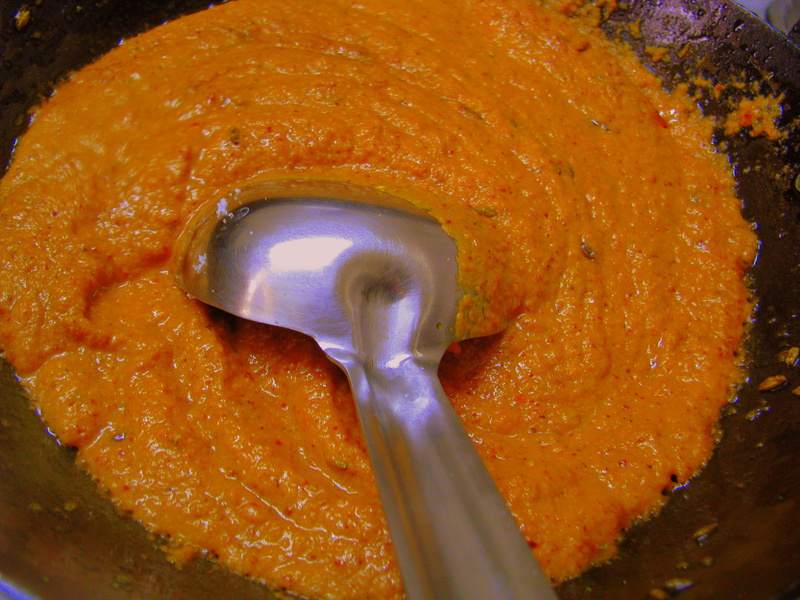 Keep the shev bhaji gravy ready when its time to serve it make I hot and add shev to it and serve it immediately otherwise shev becomes very soft. If you want to remove oil from shev to make it low calorie add shev in water and then remove it and then add it in shev bhaji rasa. 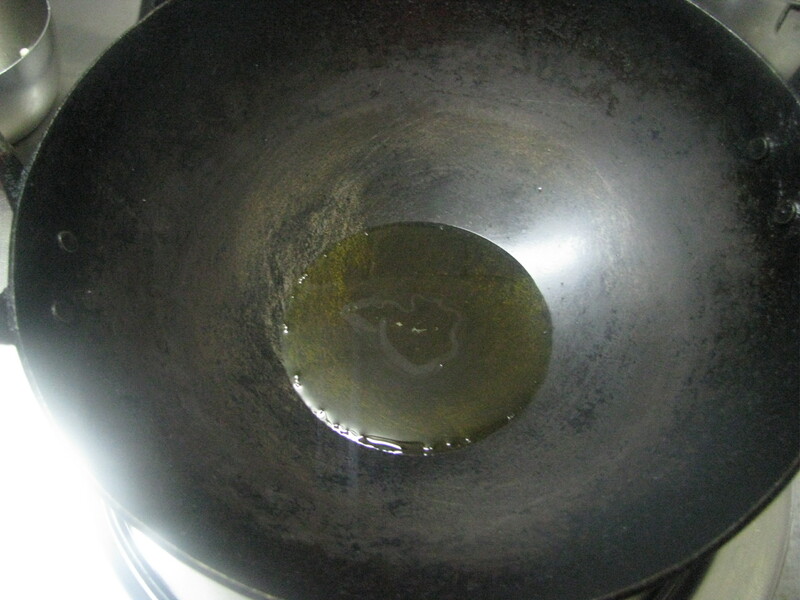 By this method we can remove the extra oil in shev (in water). Well this is for those who want to eat interesting but on diet regime. When salt is to be added ? Thanks for mentioning Bhupad. I have updated the recipe. I’ve been looking for this one since long and wanting to try it out. Will try it your way. 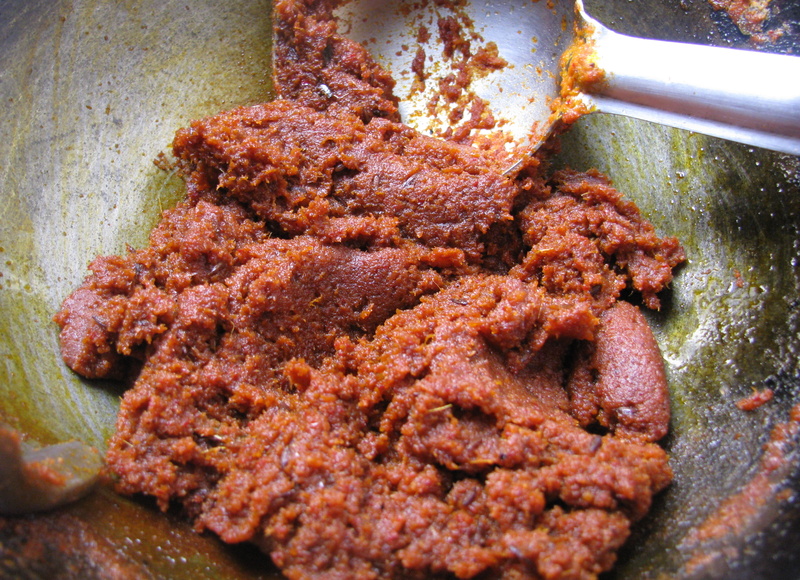 ..
You can use mortar and pestle or follow the recipe of sev tameta nu shaak http://healthyvegrecipes.com/sev-tameta-tomato-nu-shaak-jain-sev-tameta-shaak/, Use the same ingredients of shev bhaji just follow the steps of sev tameta nu shaak. Don’t add coconut if you following this recipe.Use finely chop onion,ginger and garlic to make it. You can make it with or without tomato. Thanks for the recipe..I have a doubt.. you haven’t used khada masala..like lavang,kali kiti ,dalchini,veldoda for masala..any specific reason? Thank u so much for the recipe!Tried today! !It tastes great!! मनापासून धन्यवाद! !आजच पदार्थ घरी करून बघितला!अप्रतिम झाला होता! मनापासून धन्यवाद!आजच पदार्थ घरी करून बघितला.अप्रतिम झाला होता! How many people does the receipe serve?